I will agree 100% that big knives are a pain to make and take quite a few more resources and time to complete. I also like big knives! Smaller knives are generally a bit more practical and useful; a small knife will probably be on you at all times whereas a big knife only comes along when you anticipate needing it. That said, some tasks just cry out for a big honkin' slab of steel! I suppose anything over about 6" qualifies as a big knife to me. My favorites at the moment are the Ontario RAT-7 and my new JK Camp Knife. The latter is very similar to the RAT-7 but with a higher level of craftsmanship and executed in O1 steel. I don't really chop with knives at all but I prefer them to any other tool for splitting wood into fine kindling, and baton a lot of wood for campfires. I was recently gifted several knife blanks. Here's what I did with the first one. I LOVE coffin-handled Bowies......that's an eye-popper, crash! Very nice! 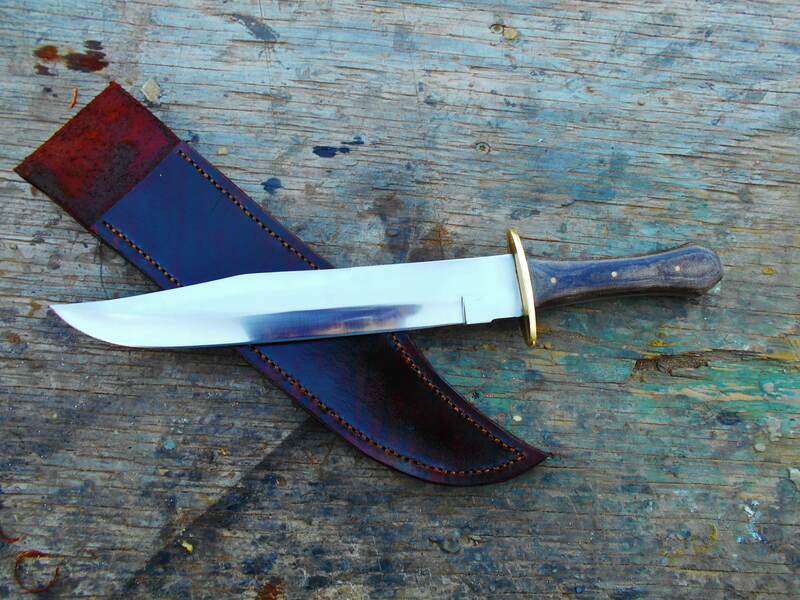 I'm not a big fan of Bowie Knives but that one's purdy!